I’ve probably written about this already here but there it goes: I usually fear (a little) watching again now the movies I loved as my much younger self – there’s always the risk of deception, the “what the heck was I thinking?” feeling. Luckily this hasn’t happened often and the movies I’ve seen lately have permanently cemented their place in my heart. One example is “The Crying Game” : I adore Neil Jordan’s work and that film is a masterpiece. These little cakes, as simple as they look, are packed with a lot of flavor – lemon and coconut are really delicious combination. Preheat the oven to 180°C/350°F. Butter eight ¾ cup (180ml) capacity muffin cups or individual cake molds*. Sift the flour, baking powder and salt together in a large bowl. Stir in the sugar and coconut. In a small bowl, lightly beat the eggs, then add the coconut milk and cooled melted butter. Stir with a whisk to blend the mixture into a thick, smooth liquid. Stir in the lemon zest and vanilla extract. Add the egg mixture to the dry ingredients all at once and stir with a wooden spoon just until incorporated. Spoon the batter into the prepared pans and bake for 30-35 minutes or until risen and golden around the edges and a wooden skewer inserted in the center of the cake comes out clean. Towards the end of the oven time, make the syrup: in a small saucepan, combine the sugar, juice and water and place over low heat, stirring just until the sugar dissolves. Increase the heat to medium and bring the mixture to a boil. Boil for 6 to 8 minutes, until the syrup has thickened slightly. Remove from heat and set aside (the syrup is supposed to be pour over the cakes while both the syrup and the cakes are still warm). Transfer the pans to a wire rack set over a baking sheet and cool for 10-12 minutes. Carefully remove the cakes from the pan, then return them to the pan (this is to ensure the cakes won’t get stuck in the pans). Use a small toothpick to make holes in the tops of each cake. Spoon the syrup over each cake and leave them to cool completely. I got to hand it to you! Ever since the first time I tried your recipe, i know I can find good stuff in here! This is no otherwise! This recipe absolutely looks wonderful. Oh, what lovely little cakes! I like your dusting of powdered sugar, too :). Cute and damn tempting cakes. Definitely two of my favorite flavors, especially for summer! I am thinking these would be great with fresh strawberries or raspberries! 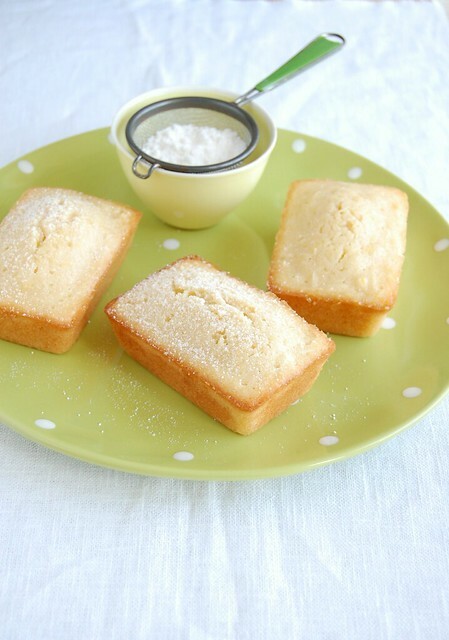 I am agree with you, the combination of lemon and coconut is wonderful, it makes these little cakes so tropical. How lovely are these little cakes?? So summery! You did an amazing job. These little cakes look perfect and delicious. They look so cute I want to wrap them up and give them as a gift. Thank you for the recipe. Lemon and coconut is always a winning combo ... you inspire me ! Patricia, these look lovely, as always. I wouldn't mind trying them as small mini cakes with some frosting, the coconut-lemon combination sounds lime a winner whichever way you try it. Thank you for sharing! I would have never thought about that combination, sounds perfect!!! And I haven't seen that movie, guess I really should!! i love this combo of coconut and lemon. these are so cute, Patricia, and I am certainly adding this to my to do list!